COMMENTS: This mold is very well made and sides are thick and sturdy. It held the soap without having to use binder clips. I have some of the other column molds and I have never had a problem with them leaking. My only negative is that the heart is a bit too big. It does fit in the rectangular 1501 mold used as an embed , but I think it is a little bit too large. Otherwise it works great. "Beware! separates while in use"
COMMENTS: If you don't clamp or tape this together it WILL come apart with raw soap in it. I promise. You'll have a huge mess. I had hot pink soap all over myself, my clothes, my floor and my table. Even after clamping with some clothes pins it tried to come apart any place it wasn't clamped.So cute mold. But if you've used others like this with success without clamping this one is not like those. It'll come apart. Just fyi. COMMENTS: Loved using this to make a heart inside another soap! COMMENTS: Love this mold! Makes perfect heart-shaped columns that embed well. I wish it were just a hair shorter so that they could be embedded into more sizes of soaps, but otherwise perfect. COMMENTS: This heart is great for embedding. I have used smaller column molds but this make a big impact!I used it with the column loaf mold. COMMENTS: Excellent mold for CP SOAPERS and melt and pour! "Popped All Over My Table"
COMMENTS: Wow... 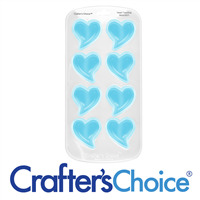 I was so excited when I saw WSS had a large heart silicone mold fit for my needs. Happily bought it and finally came the day to use it. I made a huge batch of melt and pour soap to pour into a few heart molds including this one. Made sure it was sealed and ready to go but when I began pouring in I noticed one side started to undo itself and made it hard to snap back with the melt and pour stuck in it. So I pour out the soap and try again. This time it popped all over my work table, over all the molds I had set out to work with later that day, spilled onto my floor and onto my hands (which felt lovely). I was barely able to make the mold work but I still lost a good bit of my soap I had made. • The heart shape is huge and long. COMMENTS: This mold comes out looking nice but to get to that point is a lot of work, comes apart very easily, actually had to make wood frame to slide it in to hold it. COMMENTS: I love this mold,just the right size to make embeds. COMMENTS: This mold was very easy to use. I took the advice of others and used binder clips to secure the edges and had no problem with leaking. COMMENTS: I like this mold, however be sure to clamp edges together with Clothespins or paper binder clamps otherwise it WILL come apart when pouring raw soap into it. COMMENTS: So very happy this came early. It will look wonderful as an embed for my melt and pour soaps. I can't wait to start using it!! COMMENTS: Nice 'n easy... This mold is well made and easy to use. Soap pops right out. The mold stays together with no gaps. COMMENTS: I love these silicone molds. I am not sure why people day the leak? They snap together perfectly and make the most precise embeds...I LOVE IT! "Heart Column Silicone Soap Mold"
COMMENTS: This mold works really, really well. I use paper clamps to hold it closed and place the mold in a cup to keep it upright. I use sodium lactate for easy release. There is a slight line that needs to be trimmed along each side, and I do wish it was 10" to better fit traditional loaf molds. COMMENTS: Very nice mold. I thought it would be smaller. I went ahead and ordered the smaller one. Good quality though. COMMENTS: I absolutely love this mold. 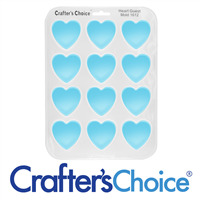 Very sturdy and I will forever begin to purchase crafters choice silicone molds!! Very sturdy, I love it. COMMENTS: This mold is fun to work with and makes perfect heart shape soap for embeds or just as decorative stand alone soaps. I recommend this mold to anyone wanting to experiment and have fun with their soaps. COMMENTS: It leaks pretty badly. The first time I used it I was relieved that I had put the mold inside another plastic container even though I had two binder clips on it. I now use 6 large binder clips to prevent this and the heart turns out really cute. "I wouldn't say an excellent product, but it's okay"
COMMENTS: I would not say that the heart column mold is an excellent product but a it is a good product. It gave me the shape and design in which I was looking for, but on the other hand, it made a hot mess. I thought I had completely closed the sides with clamps but as I was pouring the soap into this mold, the sides came undone and spilled soap everywhere. All on the carpet, counter everywhere. I lost almost a pound of soap using this mold. If you decide to buy this mold, pleASE make sure that you use many clamps throughout the side of this mold, and pour soap at temp of 123F, put this mold inside a bowl or cup just in case it break through and spill on your counter, using a cup or bowl you can still reheat your melt and pour and nothing is wasted. I am not sure if I will buy another one right now, time will tell. COMMENTS: I was a bit skeptical at first, but now I am a convert. Easy to use, soap pops right out. I CP and then embed the heart into a loaf mold, so every slice of soap has a heart in the center. Customers love this! My only suggestion is to make sure that you hold the sides of the mold shut with something like large binder clips or closepins as it can pop open. If you have them firmly shut, then the column mold is a breeze to use. COMMENTS: I use it almost every session. It does come undone sometimes and can get messy but when it works it works well! COMMENTS: Wonderfully easy to mold several bars at a time. Easy to wash, warm water. Unmolding is a breeze. After cooling, you might freeze it for just a few minutes, but it pops right out. Try the mini size mold as well. These column molds WSP sells are fantastic in value and wear and makes soaping fun. COMMENTS: I looked at this for a little while before I ordered it. When I got it I had just made a large batch of melt and pour for imbed in my soaps. I put it to work that night! It has an ingenious seal to keep the liquid soap from leaking. It makes little heart sticks so it cools quickly and you can get several made in a short amount of time. I already have about 3 rainbows worth and at least that many that I have sliced into little hearts to decorate the tops of soaps. I have been watching the other mini column molds just waiting for them to necessary available. I ordered 3 of them this week!!! I guess I better get another batch of melt and pour made up. "Holds together firmly and no bulging issues! " COMMENTS: Love these shapes! I have several of these and like all of them. I did use a rubber band for extra security like the other reviewer recommended. No problem. I didn't think about the length much, but I agree, it would be nice if they were a little longer. I have to make two and a half to use them in my long loaf mold projects as embeds. However, if they were longer, you would have to keep them from falling over with raw soap in them by supporting them some how. But very fun designs! I would buy again. COMMENTS: I made this soap to use as embed for a regular loaf soap. It worked great. Only thing I would recommend is to put rubber bands around to help it stay close. Also it was shorter than my 11 inch long loaf mold. COMMENTS: Easy to pour and easy to release my products. Great for embeds. "Saved by comments- place this mold in a pan!" COMMENTS: I just used this mold a few minutes ago, and thankfully read the reviews first. I wrapped it tightly with rubber bands and waited for my 15 oz of soap to cool slightly before I poured. I decided to be cautious and put it in a tray, just in case...glad I did! At about 3/4 full, soap came gushing out the side. But because I had been warned, I snapped it shut with my hands, poured the soap back into my measuring cup from the tray, and repoured...only to make it slightly higher before it happened again. I am letting the soap set now, and while it is not quite totally full it was still a success for the most part - but only due to good advice and advance planning. I would say plan for this mold to burst open, have a backup plan, and be pleasantly surprised if it doesn't. All of that said, the size is perfect and the heart is adorable...you just have to work with this one a bit. "I love this heart mold"
COMMENTS: This mold is quickly becoming my favorite mold. It makes a perfect heart and is super easy to unmold. I pour reinforce the sides with binder clips and pour soap at a thick trace. I absolutely love it! "All I was left with was a mess!" COMMENTS: I have used the star column mold in the past with no issues. The heart is another story. After melting my soap, adding my mica I preceded to pour the soup base into the heart column mold. About halfway filled the mold opened up pouring red MP all over my kitchen. I save what I could and poured into my square mold, but lost about 10oz of MP base. After cleaning the mess up, I was clearly upset and put my supplies away. The FAIL got the best of me so I decided to try again. This time clamping the taping and clamping the sides. To protect my counters, floors and myself from another disaster I places the mold in a shallow pan. Thank goodness I did, because the weight of the soap, this time 3/4 of the column filled it came apart again. Again, I lost MP base and mica. I am just thankful I don't put FO in my embeds. This mold is too flimsy and can not support the weight of the soap once half full. Do not recommend anyone buying this unless you like the mess and waste. WSP Response: As with all products, a little trial and error is necessary. The issue you are experiencing may occur if your soap is too hot when pouring. We recommend using a series of rubber bands or binder clips to help hold the column molds together before pouring. COMMENTS: I used this to hold my cold process soaps. The mold is nice, as long as, you don't try to move it. I tried to move it over a little and the mold broke open and the soap went everywhere. 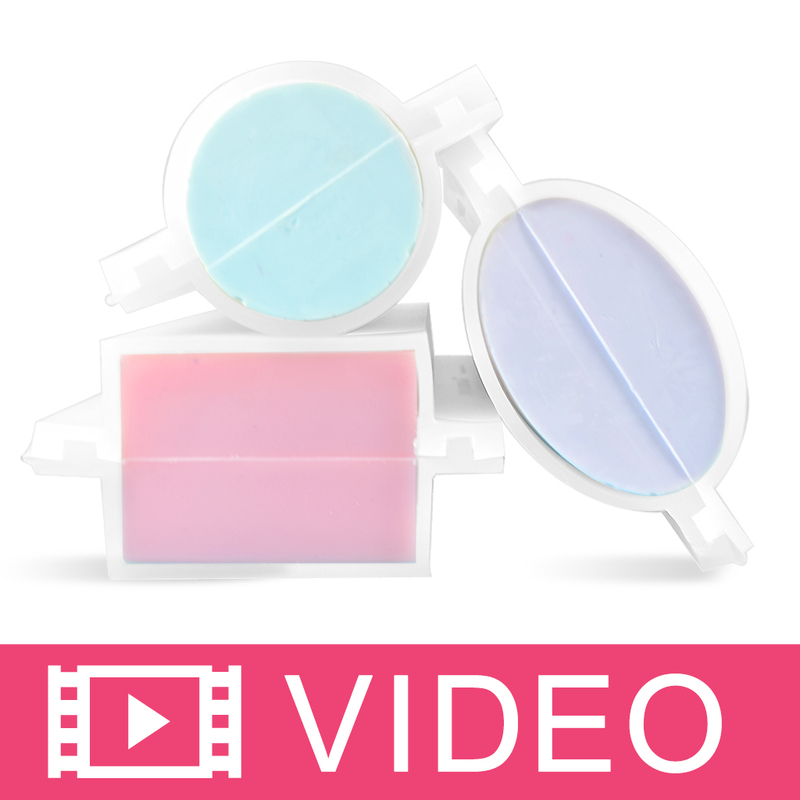 "Works well, use clamps for the sides"
COMMENTS: I got this to add some flare to my cp soaps. I ordered the love spell fragrance oil and made a Purple Heart using the mold. I had to work fast to put clamps on it so I wouldnt lose my soap. Other than that it is absolutely perfect. COMMENTS: This was the first time I used a column mold. I turned out great. "Will it work to make the embed in melt and pour and the soap around it in CP soap?" "The information only lists the mold dimentions, what are the dimensions of the actually heart?" Staff Answer Hi Andrea - The dimensions of the soap are what is listed. Sorry this wasn't clear. They are 8.125” x 2" x 2.25"
"Good day, In the Additional Information list it shows "Makes (1) heart shaped column. Measures 2" wide x 2.25" long x 8.25 deep." Can you please confirm if the dimensions are the full mold (ie Hinge to Hinge) or if it is for the Heart/Finished column/product? Thank you for your time. " Staff Answer The Hear Column Silicone Soap Mold 2001 does measure 2" wide and 2-1/2" long at the widest and longest part of the heart. However, the actual depth for poured soap is 7-1/2". The 8.25" depth given in the description is for the entire mold, not the actual interior cavity. "Does this mold hold at least 1 lb of oils? If not, how much does it hold?" Staff Answer This mold will hold 15oz by volume. With fragrance oil and vanilla color stabilizer, I can get about 14 ounces of melt and pour soap into this mold. "Do you have to line these? " No, that's the beautiful thing about silicone! "How much soap will it hold?" Staff Answer This mold holds 15 ounces of soap. "Are there caps on each end of the mold?" Staff Answer There is no caps for the ends of the mold. One end of this mold is closed and has a flat bottom so you can stand it up. The other end open end is where you pour your soap into. "It's hard to tell from the picture and there is no further description for this mold. Is it like some sort of a clam shell silicone mold where you fasten it together to pour, and then open it up alongside the seam to make it unmold? " Staff Answer This mold is one piece but actually opens up and can lay flat. It has a hinge in the middle which allows it to open and close. It snaps together on the side and the soap is poured into the top. Once the soap hardens, the side can be unfastened and the soap can be easily removed.